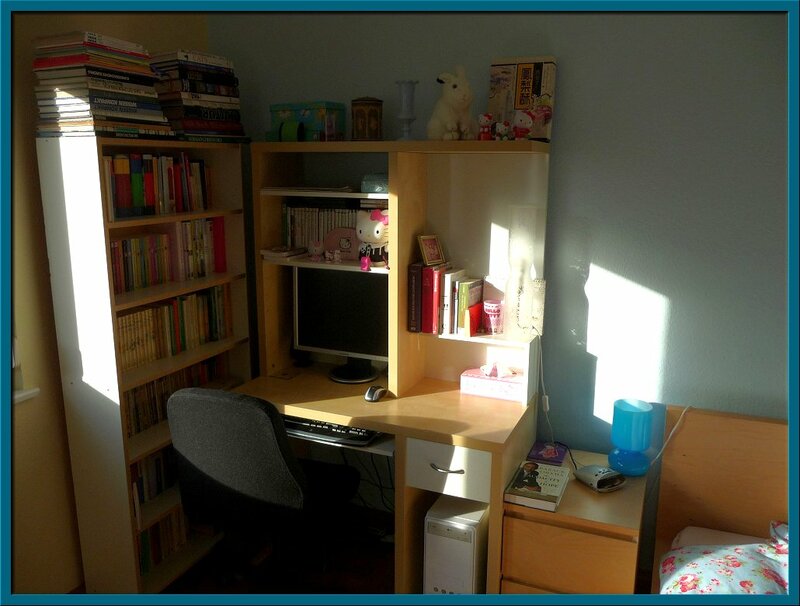 Scene of the Blog Featuring Meike of From My Mental Library! I happened to stumble across this week's featured blogger by reading a comment she left on another blog. When I tracked Meike down to her own blog, From My Mental Library, I lost track of time as I wandered through the posts of this talented writer from Germany. Here are the categories listed just below the header: Book and film reviews, Daily Life, Family, Fashion for the shallow-minded, Inside My Mind, Recipes, Short Stories, Special Occasions, Travelling. I think it's easy to see that this is a special blog just from the categories! If you've never visited From My Mental Library before, I certainly hope you take the time to do so, and please remember to say hello while you're there. If you're visiting from Meike's blog-- Welcome! If you'd like to see any of the photos in a larger size, all you have to do is click on them and they will open in a new window. Of course, you're also welcome to click on the Scene of the Blog tab at the very top of my header to take a look at the creative spaces of other book bloggers from around the world! Meike is ready to give us a tour, so let's not keep her waiting! 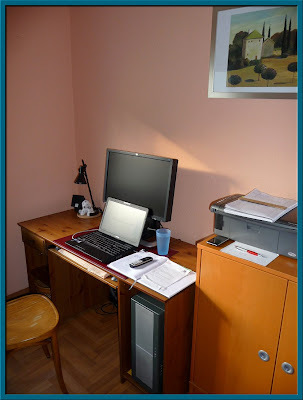 Still relatively new in Blogland (I started in March 2009), I soon realized that I had found THE literary genre for myself. Lacking the stamina for a novel (a draft has been in my head for at least 20 years) and the necessary time and funding for a non-fiction work, but feeling an essential need for writing, there is nothing that fits the bill as well as blogging. Here, I can go on about whatever I have in mind, for as long or as short as I want to. I can show my readers pictures, share recipes, voice my opinion about any subject under the sun, write book reviews and publish my own short stories, all of which I have done in the past and hopefully will keep doing. My readers are very important to me, and I appreciate each and every comment. At currently 60 followers (one of which is I - something I don't think should be technically possible, but there you go! ), I know that there are huge numbers of other bloggers out there with a really impressive list of followers, but what counts to me is that I am able to keep in touch with those select few who seem to like returning to my blog, and have something interesting, funny or encouraging to say. My personal computer is in my bedroom, and it is here where I mostly read other blogs and write my own, and also where I play my favourite computer games, The Sims 2 and The Sims 3. Click on the photo to read some spines! Originally, I was trained as a library assistant many moons ago. My love of books is not quite as evident in my flat as it could be; I have downsized considerably, and nowadays mainly get my reading from the library, lacking both the money and the space for buying books as much as I'd like. To the right is a closer look at the book shelf next to my computer. On the lowest level are old childhood friends such as the Narnia books, and several photo albums. The second level from the bottom contains my collection of space and space-travel related books, as well as some works about and by Wernher von Braun. Then comes a shelf filled with the "Insel" (German for island) series, which I used to collect when I was younger. A lot of those are ex-library books that were about to be thrown away. Above those, another level full of childhood friends, namely by Edith Nesbit and Astrid Lindgren, two authors whose influence on children's literature in general and my childhood in particular was and still is tangible. Next is my M.C. Beaton shelf. Yes, I know - this is not for the high-brow literature lover, but these are books I enjoy, and I keep getting more and more from my mum, and also from my mother-in-law in the birthday and Christmas parcels she sends from England. Most of you will instantly recognize the colourful backs of the Harry Potter books on the top shelf, and above that, all the large-format books which you sometimes find classified as coffee table books. A lot of my reading happens here. 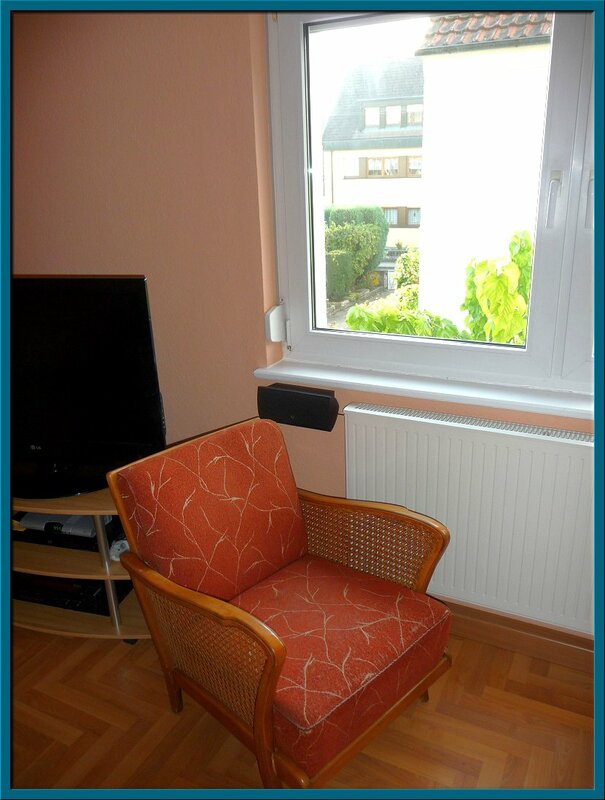 This old armchair was part of my grandparents' living room furniture, and it is so comfortable that I spend many of my lunch breaks there, when I am not going out for lunch. The armchair even has its own blog entry! In May of last year, I changed jobs and now work from home. When my personal computer needed a new HDD the other day, I was glad to have the corporate laptop there to keep me connected to Blogland! This is my home office. The recipes you will occasionally find on my blog have been tried, tested and photographed here! And one of the very first blog entries I ever published was about this little old lady. 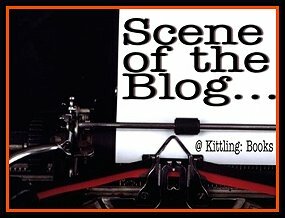 Thank you, Cathy, for offering me the opportunity to appear on "Scene of the Blog"! You're very welcome, Meike. Thank you so much for the tour. I think I speak for everyone when I say that I enjoyed it very much! I love all the light coming in the windows and all the greenery outside. (Can you tell I live in the desert?) That lovely "little old lady" looks as though she's waiting to help you with your next blog post! I hope you all have enjoyed this week's Scene of the Blog-- and please don't forget to check out From My Mental Library! Stop by next Wednesday when I'll be featuring another book blogger from our worldwide community. Thank you, Cathy! This was great fun and I am just about to post about it on my blog. I'm glad you enjoyed it. It's a pleasure having you here as my guest! As a Librarian follower, I really enjoyed it too. Thanks for stopping by. You now have a new follower to your own blog! I enjoyed this very much and will go over see Meike's blog. How could I not love a bookshelf that has Harry Potter on the top shelf. And...I really like M.C. Beaton too. Love the glimpses of the world outside and the plants in the kitchen window. Thank you very much for this behind the scenes look at 'From my Mental Library' which we have so enjoyed. 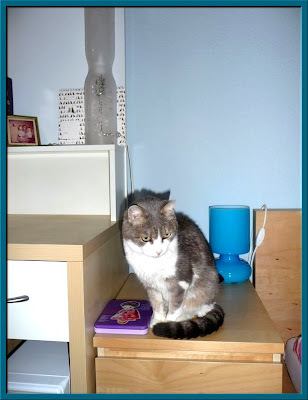 Meike is a talented and witty writer whose eclectic and well written posts we very much enjoy. She is also a generous commenter which means that one can establish a dialogue with her, something which is very important to us. Happily, we have now found you and have signed up as Followers in order to stay in touch. Thank you so much. I'm now following your blog as well! Cathy, I too have signed on as a Follower and thank you for Meike's blog. I enjoy her. She tops the list of bloggers for me. We found we had a mutual interest in Wernher von Braun even though I live in the California desert (I actually shook his hand once!) and she in a 'small town in Germany' (kudos to John LeCarre). I love that blogland allows us to visit, personally, all around the world. I love that factor of the internet, too, Jill. In fact that's how I met my husband. I imported him from England, and we recently celebrated our tenth anniversary. Cathy, Steve (my late husband) and I met on the internet, too - I imported him from England as well! The women of England seem to be letting a lot of good ones get away.... Puzzling. Enjoyed this so much, I love Meike's book reviews and her analytical mind! I also love Meike's blog and I am happy that you have featured her blog here! I really enjoy her writing and photos. I've been doing that, Kay. I'm so glad you stopped by! What an interesting blog. I have been following Meike for awhile and through her announcement that she had been featured came here. She was right -- this is an interesting conduit to other bloggers. And, I applaud your decision to feature Meike. 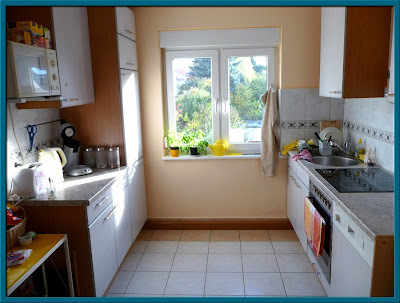 I visit Meike's blog regularly too and have always enjoyed it thanks for showing us her spaces! Beautiful Meike! Most of the people I know in blogland (myself) included seem to have started life as librarians or library assistants. I was amused to read the paragraph beginning 'Lacking...', That so sums up my reasons for blogging. I'm also amused at how many mutual fellow bloglings Meike and I have. It would be great fun to trace back the source of all these mutual links. I love your yellow watering can in the kitchen, Meike! The watering can was a gift from my mum - she gave me a red one first, because they didn't have a yellow one at the shop at that time, but when she found a yellow one a little later, she took the red one for herself and gave me the yellow one. My mother was the librarian in our village, so I grew up in one and once I was old enough, the village paid me for working there. 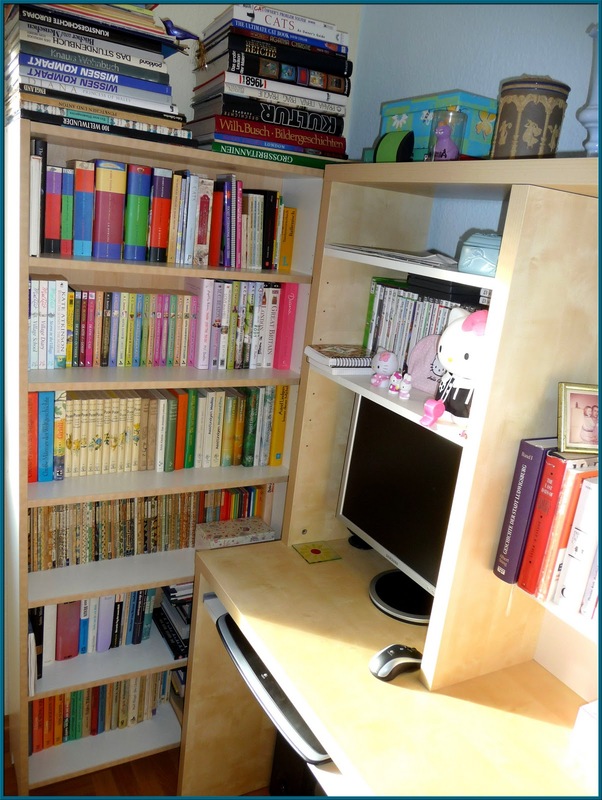 Meike's books are so neat - they look almost as if they've been arranged by color! I'm so glad to have found her blog (thank you, Cathy)! Hello Debbie, in a way, they are arranged by colour; all books that are part of a series and/or by the same author are together, and that makes for the neat look since I own several series. Shelleyrae, no need to feel intimidated :-D I assure you I am perfectly chaotic in other ways!